This review is a part of the 'Casual Collection: July 2011 New Releases' article. Buffeted by gale force winds and blinding rain, a seaplane struggles to land on an isolated island, from which meteorology professor Kelvin and four students have gone missing after sending out a distress call. Matters quickly turn as murky as the weather after landing, when the search-and-rescue pilot discovers a heavy-duty cage from which something clearly powerful – and non-human – has escaped. 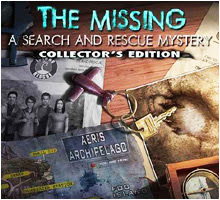 Playing as the pilot in Sulus Games' hidden object adventure The Missing: A Search and Rescue Mystery, it's your job to decode the clues left behind by the missing people in the form of notes, instructions, photos and radio transmissions, in an effort to trace their whereabouts before it is too late. The mission starts well, ominously bringing to life the desolate and menacing, yet undeniably beautiful, islands with a real sense of urgency. Unfortunately, instead of weaving it into a tight, multi-pronged mystery, the developers ingloriously demystify the story by simplistically revealing the villains – both supernatural and human – within the first half hour of the game's almost four-hour duration, though inexplicably, neither inflict any damage on our protagonist despite multiple opportunities to do so. The secret of Kelvin's research into harnessing the energy of meteorological phenomena – the cause of the chaos – is exposed all too soon as well. This reduces the challenge to a perfunctory expedition through the tropical isles in vicious weather, collecting tools and solving elementary puzzles to unlock containers, entryways and machines in order to find the science crew and, eventually, defeat the inefficient baddies. Toto and Fog, the two islands, were once inhabited by an ancient tribe, creating a mélange of aging scientific paraphernalia and indigenous structures adorned with codified hieroglyphs. The newer constructions, which include accommodation camps, a bunker, lighthouse, weather station, an undersea port, a rambling mansion with an antique cannon, and even an incongruous ice station (explained via the 'control nature' theory), serve as the setting for the straightforward quests – inventory tasks, hidden object searches, and logic puzzles. As you explore the 100-plus screens, the main focus lies heavily on the search and use of interactive items to solve practical problems. But while these tasks are well-integrated into the story, they are also repetitive and obvious, never taxing your imagination in the slightest. Onscreen hotspots sparkle frequently, further simplifying the process. There are only fourteen hidden objects screens in the main game, and though they aren't repeated, they keep regurgitating the same drab items like drills, wrenches, binoculars and hammers. In a slight twist, some of the screens represent dark areas that have to be partially lit using a flashlight, while some have objects displayed as silhouettes instead of words. The dozen-odd standalone puzzles, comprising pattern and number matches, rotator jigsaws, sequencing tasks, gear alignments and pipes variations, are rendered thoroughly undemanding by obvious clues and easy mechanics. Most use codes found elsewhere, and only one – creating a key using a mirror image – poses a genuine challenge due to its visual complexity. Puzzles can be skipped, though it likely won't be necessary. The rechargeable hint button either marks out onscreen areas where tasks are pending or picks out a random hidden object from the list. You also have to collect 56 energy crystals strewn about the islands to power Kelvin's invention, but that's not difficult either. Though linear in logic, the game offers multiple areas for exploration at all times, each requiring repeated visits, though the smart placement of locations and sound rationality of the tasks prevent backtracking from becoming tedious. A journal records broad objectives and discovered clues, and maps out the islands and your current placement. While areas aren't explicitly marked off as 'completed', at key junctures cleverly designed events cordon off places where no activities are left. Despite the simplistic gameplay and non-mystery of its plot, The Missing manages to hold your attention due to its sleek, intricate production. Realistic art, graceful ambient animation (lightning, wind tunnels, swinging doors and lights), relevant sound effects, and an intense but soulful soundtrack generate a fair bit of drama, often creating the illusion of actually exploring the drippy, forested islands. The first-person perspective is underlined by bordering the screens with the edges of scuba goggles or a fur-lined jacket hood when worn. Several fully-animated cutscenes intersperse the proceedings, and some, like the sequence of the seaplane crashing into the ocean, are spectacular. There's no voice acting, but given that most of the adventure is solitary, that's not a critical omission. The main game wraps up with an all-too-convenient but conclusive finale, so the Collector's Edition provides an hour-long unnecessary prologue of how Kelvin discovered the islands in his youth and thought up his project. The six hidden object screens are repeated once each, and yield mundane tools from random collections of Mayan statues, Indian figurines and gothic gargoyles. The half-dozen watered down standalone puzzles require you to manually note some of the code patterns to avoid backtracking. This chapter emphasizes inventory quests built around Kelvin's escape from an indigenous temple, and the clever interplay of natural elements make the final half-hour almost worth the extra investment. Despite starting with the strong premise of a search-and-rescue operation gone wrong, set against a visually arresting backdrop bolstered by superior production quality, this game quickly loses its way and ends up in hackneyed territory. It pointlessly overloads the sensible plot with diverse topics such as the pitfalls of human greed, environmental consciousness, and marvelous anthropological legacies, and tries to intimidate with two namby-pamby villains instead of the true obstacle to any rescue effort – the uncontrollable forces of nature (ironically, just what it's preaching about). The tried-and-true casual gameplay still holds up as moderately entertaining, but ultimately, The Missing: A Search and Rescue Mystery misses its landing on the shores of greatness and skids into the dreaded so-so zone.